My mother was deeply forgetful and living with Alzheimer's. She did not seem to know or understand that she could no longer live or operate on her own. Person living with Alzheimer's can say mean things. "Get out, I don't need you, I can take care of myself"
Like any typical person this hurt my feelings. My mother did not seem to know or understand that she could no longer live or operate on her own. So what did I do, I tried to explain to her that she couldn't live alone without me. More than once I answered her meanness with a meanness all my own. I told her if I left she would be put in a "home". My mother's greatest fear in her adult life was that she would be put in "home". She had told me, I'll kill myself before I let anyone put me in a "home". For my mother a home, an assisted living facility, was a nasty place. I can only imagine what she saw when she was growing up. A person being put in a nasty place, a dirty place, where the care was pitiful and the person was abandoned and forgotten. Fortunately, once I made it to Alzheimer's World I realized when my mother said, "Get out, I don't need you, I can take care of myself" that is not what she really meant. Don't leave me alone, I'm scared, please don't put me away in a home. My mother was clearly scared, afraid, anxious, and confused. I should have noticed this in the look on her face, or in the sound of her voice. Once I had gained this understanding the solution became obvious to me. I had to meet her behavior with kindness and understanding. Oddly, a completely opposite reaction than I might have had in the real world. Instead of getting angry or meeting her words with meanness I took the complete and totally opposite approach. I'm not going anywhere, we are here together now, and I am going to take care of you. Instead of being an Antagonist, I became the Protagonist. As the protagonist, I learned to reduce the conflict, the meanness. Instead of making things worse, I learned how to make things better. Sad because I was mean in the beginning, yes. But proud of the fact that I changed and become an agent of positive caregiving, yes. It took a while, but yes, the fact that I was her care partner and caring for her sunk into my mother's brain. The meanness, all of it went away. Almost of all it anyway, we did have an occasional episodes. What we did not have was daily episodes of meanness, confusion, and anger. Alzheimer's World is wild, sometimes crazy, a backwards place . 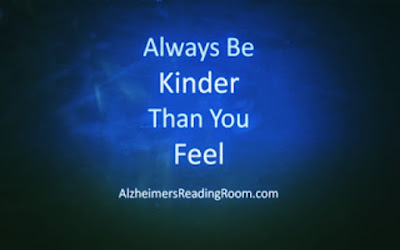 I learned that in Alzheimer's World words from an Alzheimer's patient are often a cry for help. Many times what an Alzheimer's patient says is exactly the opposite of what they mean. So I started meeting meanness with an equal and opposite reaction - kindness. This is how you learn to cope with Alzheimer's. Understand, cope, communicate. Over time when Dotty said something mean to me I actually smiled and laughed. I had left the burden behind. I had found a better place, a world filled with Joy. A kinder, gentler, more loving, caring place. Bob DeMarco is the Founder of the Alzheimer's Reading Room (ARR). Bob is a recognized writer and speaker in the Alzheimer's and Dementia Community worldwide. The ARR Knowledge Base contains more than 5,000 articles. Bob lives in Delray Beach, FL. The Alzheimer's Reading Room operates for the benefit of society, and for the benefit of the Alzheimer's and dementia communities.